Smart Department Inc., Author at smartdept. inc. So far Smart Department Inc. has created 625 blog entries. 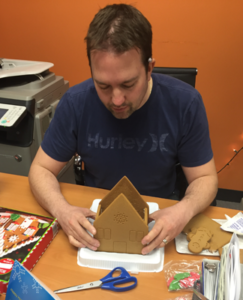 This past week our very own Matt Crook celebrated 10 years at smartdept. inc. Congratulations, Matt on this incredible achievement. Back in September, Leah Bye, a Chicago smartie, and Hannah Morgan, a Grand Rapids smartie, teamed up and utilized their talents to help out the Grand Rapids community during Weekend Blitz. Weekend Blitz, an event that unites local professionals and organizations with big hearts and a fierce need to collaborate for the good of the GR community! This is a weekend long design challenge, conceived and coordinated by AIGA and Design for Good Western Michigan*. Teams of 8-10 professionals volunteer from a wide variety of industries (design, tech, marketing, etc) are paired with ten local organizations in need of their skills and talents. A team lead works with a mentor to define the organization’s greatest need and then strategically assigns tasks to teammates. From there, the teams closely collaborate with each other and a representative from their organization throughout the weekend. Weekend Blitz reimagines the essence of design and playful thinking through the lens of an accelerated timeframe. Opening an office in a new market has been adventure. Now five months into the process with a few freelance roles under my belt and a couple direct hires – I would love to share the methods I have been utilizing to become a successful recruiter, and grow our brand in this new market! 1. Networking – it is all about networking, people! Grand Rapids is very unique in the way that it is all about “who you know”, well I want to know EVERYONE! Meet EVERYONE – It is crucial to build relationships and truly put yourself out there. Networking has been a huge chunk of how I have met clients and candidates alike. There are tons of different ways to network – virtually on social media, monthly or weekly meet-up groups, formal and more casual happy-hour events, alumni events, and events created specifically for creatives. I have attended them all – even a web development group where I felt completely foreign when they were talking “shop”, but found some awesome talent that has spread the word about us! 2. Utilize ALL relationships for growth – it doesn’t matter if I knew this person five years ago from college or met them six weeks ago in the coffee shop, I have noticed that it is an absolute must to connect with everyone I can (and I’m not shy about it either)! This community is so eager to help others. They love spreading the word about openings to their friends, colleagues, and students! I have had a blast meeting new people and appreciate all their support as we continue to grow. Quick response time – One of the most successful practices I utilize is quick and consistent response times to both clients and candidates. The appreciative feedback I receive from them reminds me how important it is each time. Even if I respond letting them know I will reply later, they feel much more comfortable. Willingness to go above and beyond – With the partnerships I have made so far – no questions asked, I go above and beyond to make any connection, answer any question, and support them through the interview or hiring process. With the candidates, I do my best to support them by assisting with resume edits or supplying them with ways they could build upon a certain skillset. I also invite my candidates to attend networking events with me, and they love it! Strong and friendly communication – Communication is key in this market! Our clients like to move at their own pace; some really fast and others like turtles. I connect with the candidates often to keep them engaged and their spirits up reassuring them that the position is still moving forward or has taken a pause. Throughout the process, I found that most of my candidates are AWESOME! So, I prefer to check in with them to see how they are doing, or if they have done anything exciting lately, too! Consistent client check-ins have proven to be successful as I have snagged a few recent freelance roles from simply saying ‘hi there! Hope you’re doing well…’. KEEP EVERYONE ON THE SAME PAGE. 4. Source, Interview, Source, Source, Interview! This day to day here for a consultant may look a bit different because I spend A LOT of time sourcing, and A LOT of time interviewing. My goal has been to interview 10 or more candidates a week. I enjoy meeting the candidates in person because they are able to put a face to a name, feel us out, and I instantly have an idea of where I could see them being placed in the future. I really enjoy sourcing, and playing with the multiple ways you can find talent! Of course LinkedIn Recruiter is my best friend, but I find a lot of great talent through my networking group websites! Grand Rapids can feel quite small at times, and it can be a challenge to find multiple candidates for a specific niche, so I pull from other markets like Kalamazoo or Detroit. Adding those areas into my search and sourcing process actually landed me an amazing candidate that made the physical move for a full-time position in Grand Rapids!! Overall, these past five months have been fantastic! Things are really starting to get moving on the client front with the help of our new business development consultant, Colin. If we continue to provide top of the line customer service and present top talent, we will definitely reach our goals, and perhaps surpass them! 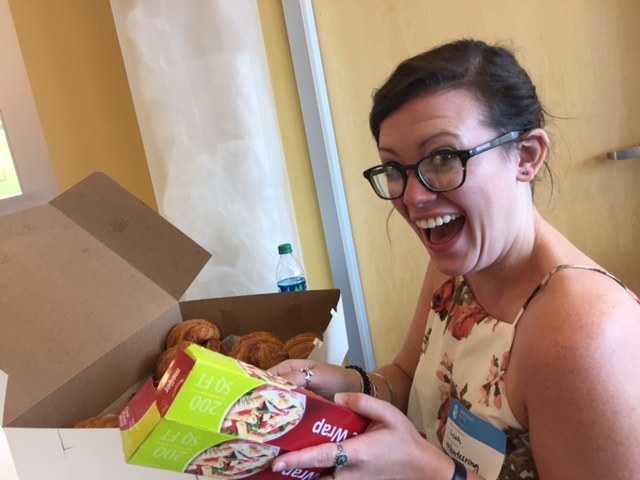 Hannah Morgan, our newest creative consultant in our Grand Rapids office, is a Grand Rapids, MI native and a proud Grand Valley State alumna. She is excited to be connecting her creative community with top clients in the area. Hannah familiarized herself with AMA (American Marketing Association of West Michigan) through one of her creative candidates. Most recently, she was given the opportunity to create the AMA blog post highlighting the last meeting of the year. The topic covered this time around was “How the Digital Age has Changed the Marketing and PR Game”. We are thrilled to share this with creatives alike! You can call it River City, Furniture City or Beer City (because it’s known by all three). And now, you can call it the newest home of smartdept. inc. That’s right! Just like LeBron took his talents to Miami (and then back to Cleveland), we are taking our creative, interactive and marketing recruiting talents to Grand Rapids, Michigan. Effective April 15, 2016 the second largest city in the great state of Michigan, located 30 miles away from a lil’ lake with the same name (that’s Lake Michigan), will be the next location of smartdept. inc. Grand Rapids is a diverse city known for healthcare, consumer goods and the arts. It’s growing and people dig it (we have this in common). If you know anyone in Grand Rapids who would find our service useful, tell them we just arrived and we need some help unpacking. I Wanted to Be an Archaeologist—and Now I’m a Recruiter! Did you know what you wanted to be when you were little? When I was a young lass, I dreamed of becoming an archaeologist. Harrison Ford wasn’t my only motivation, though. Getting to the core of a problem, digging until the treasure was found… it gave me a thrill. As I got older, my dreams turned into more realistic goals such as becoming a private investigator, a published author, or a master of espionage. I began working in customer service when I was 14 years old, and since then I’ve worn many hats: restaurant manager, dance instructor, pre-school teacher—I even spent one summer doing an archaeological dig on Palomar Mountain, near San Diego. I was introduced to Meghann, the Seattle smartdept. inc. branch manager, in February 2015. Recruiting was always in the back of my mind, but after our meeting it was all I could think about. I knew this was it. From February to November, I dug up everything I could find on recruiting. This cemented what I already felt in my gut: Recruiting is my jam. My first day at smartdept. was on November 30, 2015. What games were you drawn to as a child? Crafting? Rolling around in the mud? Both? I never minded getting dirty, but I wasn’t interested in dealing with activities that felt “messy” to me. Who did you idolize when you were young? Any strong, successful woman caught my eye as a youth, but I always liked the stylish edge that’s possible with office jobs. Where do you live? Seattle? Chicago? LA? No matter what city I’ve lived in, I’ve discovered there will always be needs that align with whatever skills people have acquired or desire to acquire. Finding the perfect job is translating your dream into reality. It’s possible! For example, if you know you’d be the perfect graphic designer but you dream about being inside the Matrix, designing systems, perhaps you should become a developer! Regardless of the field you choose for your career trajectory, we live in a tech world that’s changing every day—almost too fast for us keep up with. Tell me about your dream job—I have ideas! The world is your oyster, my friend. You got this. We can help! However, be aware of… the Cozy Monster! That’s right, you’re most susceptible to being attacked by this subtle beast when your confidence is at its peak. Imagine that you just finished guiding a prospective employer through the final pages of your portfolio. You can sense he or she is impressed. You know things are looking good. Really good! All of a sudden, you feel yourself lean back in your chair and fold your hands behind your proud little head. Uh-oh! Now the Cozy Monster has got you, and there’s nothing you can do. The next thing you know, your shoes are off your feet, your feet are on the desk and this interview is in the toilet! You’ve become another victim of the Cozy Monster! Having come from recruiting for an experiential marketing agency and then switching to recruiting for a creative staffing agency, I had no clue that there would be so many differences—or so many similarities! But there definitely are. At the experiential agency, I was mainly staffing brand ambassadors, or “field/temp” staff, who worked with our brand-specific touring teams at nationwide events. All roles were remote, and typically I was staffing for anywhere from one to three markets across the country during a single weekend. At the smartdept., we staff within the Chicagoland area. Our clients reach out with open positions so we can assist them in finding a match for their needs—someone who can complete their team, enhance their vision, or even build their brand/company. So, is all staffing the same? Is staffing just “staffing”? That’s an interesting question, given the number of factors and players at work. And if it’s not, what are the differences? It seems pretty obvious that location would affect sourcing and staffing, but this is definitely one of the biggest and most surprising similarities I’ve found between creative and experiential recruiting. For the experiential agency, location was huge. I typically worked in several markets at the same time, but often in obscure locations and literally across the country from one another other. Staffing locations that are far from a major city was definitely a huge challenge. For the smartdept., location has also proved to be a challenge. It’s often hard to find suburban candidates who are able to travel to the city, and vice versa. It’s especially challenging for recruiters sourcing in cities that rely so heavily on public transportation. Many candidates don’t own a car and therefore can’t make it to certain client locations. One difference I’ve found is who your contact is and getting information from them regarding the roles or staff needed. At the experiential agency, you’re most often in contact with the account team, who relays what staff the program needs for certain events. Although you don’t interact with the client directly, you learn which types of staff work well with the touring field/staff, what the program or brand needs, etc. At a creative staffing agency, you have direct access to and conversations with your client. You can get to know them personally—what types of personalities might fit their company, the typical types of backgrounds they look for, and what types of needs they most often have. In terms of differences and similarities, this is a biggie. Both styles of staffing require you to be on your feet at all times, constantly sourcing for viable candidates, and filling roles as needed. At the experiential agency, we typically had schedules for event dates up to a month in advance, so we were able to source and staff events ahead of time. In retrospect, we often dealt with event cancellations, location changes, rescheduling events to different weekends, or even events that were booked the night before they started—meaning we were forced to find staff on the fly. At the smartdept., we usually don’t know in advance what requests are going to come and when the staff will be needed. Of course, we can anticipate that certain clients will have needs at specific times of the year, but there’s no guarantee. This is why proactive sourcing is huge for a staffing agency—you must always have a solid pool of candidates who are capable of meeting your clients’ needs. This is another significant difference I’ve found between the two. A phone call is always different from meeting in person. Experiential hiring for temp staff or event staff doesn’t allow you to interact with your candidates directly; you’re usually doing interviews on the phone or communicating via email. Recruiting for local candidates means you can meet your candidates in person, read their mannerisms and body language, and even look at their work with them. I think this is especially important for the “creative” roles that the smartdept. recruits for—watching someone explain their work allows you to see how passionate they are about it. Don’t get me wrong—staffing remotely is great—but there’s something really awesome about being able to meet your candidates in person, getting to know them firsthand, and continuing to work with them for several years to come. So, the answer to the question, “Is all staffing just ‘staffing’?” is … yes and no. They each have their place in our business, and they each have their own challenges and rewards. There’s something for everyone in this fast-paced, fascinating industry! I’m frequently asked by job seekers how to work with staffing resources and recruiters. Below are the top four things that help me find you a job. I want to know everything about your job search. Tell me how many irons you have in the fire. You won’t offend me if you tell me you’re working with another recruiter at a different staffing resource, but not telling me you’re interviewing with prospective employers puts me at a disadvantage. I want to be able to tell my clients that you’re actively interviewing and most likely won’t be on the job market long, thus expediting the interview/offer process. I also don’t want to blindside my clients. If I have you scheduled to interview for a contract or direct hire position – you seem interested in the role, and the client seems interested in you – but then you accept a different position the day after your interview. Transparency is key in helping me find you a job. If you receive an offer or know one is on its way, tell me so I can leverage that with the clients I’m trying to place you with. I need a clean resume and a LinkedIn profile that supports the content of your resume. LinkedIn is a tool that isn’t going away. It’s only getting more popular, so make sure your profile is up to date and doesn’t read like your Facebook page. Your profile on LinkedIn is your own personal brand – handle it with care. If you have a Facebook page and don’t feel the content you post is appropriate for prospective employers to read, keep your Facebook settings private. This goes for any other online presence you have that is non-professional. Double check the content you post online and keep your settings private if you don’t want a potential employer to read it. I want to hear from you as quickly as possible. If you’re on the hunt for a job and I’m calling to talk with you or email you to tell you about a new opportunity, you may lose out if you don’t get back to me quickly. My goal when working with a client is to find the best fit for their current need as quickly as possible. Sometimes I’m competing with another staffing resource that is also working on the same position, and sometimes I’m the only recruiter supporting the role. Either way, my response time to my client is key and I can’t present you to my client without talking through the role with you to determine the fit. I work for you (the candidate), and for my client (your prospective employer). I want to get to know you and I need to understand what’s important to you in your next professional endeavor. However, I might not always have the right role for you right away. Job searching is a process, and one that usually happens multiple times throughout your professional life. Don’t give up on me if I don’t find you a job right away. Stay in touch even after you find a job. I have candidates that have become my clients and then become my candidates again. They’re some of my favorite people to work with because we’ve developed a relationship over a number of years. I look forward to grabbing coffee and catching up with them. I try to meet with all my candidates in person, even if we’re unable to do a formal interview at my office I’ll meet you for coffee – just ask me! I not only want to find you a job, but I want to make a long-term hire for my client. My client pays the bills, but for the job seeker my services are free. I’m another set of eyes looking for roles on your behalf. Help me help you (Cuba Gooding, Jr., Jerry Maguire – yes, I made a Jerry Maguire reference). Okay, it’s true, zombies are as popular as ever. Movies, shows, conventions about movies and shows — it goes on and on. Hey, for the purpose of entertainment, I love them too. But there’s one place that zombies are not welcome (anyone?). That’s right. In an interview. In this context, a “zombie” refers to a person who continually gives one-word answers and generally refuses to engage in a “conversation” during the interview. There are many elements involved in successfully navigating the interview process. The most obvious is having the exact skill set the prospective employer is seeking. But perhaps the second most obvious is communication — being able to talk through a solution you’re offering in your portfolio, for example. Or, your approach to a difficult situation you encountered at another job and how you worked through it. Clear, concise communication can leave a prospective employer impressed and can sometimes be a difference maker if other elements of your interview come up short. Besides, think of all the money you’ll save not having to buy zombie make-up! All by simply being conversational with your approach to an interview. I graduated from Indiana University with a degree in television production. But even though my background exposed me to the creative process, I would never have claimed to be an expert on the subject — prior to becoming a Creative Consultant at smartdept. inc., that is! I began my role as a Smartie almost 4 months ago. On my first day, I could hardly fill out an I-9 form, let alone confidently identify the difference between a UX and UI designer. I discovered that my television experience — combined with a minor in graphic design and some terrific mentoring from my fellow consultants — has allowed me to very quickly become comfortable in my new role. Prior to joining smartdept. inc., I had the good fortune to work as a web producer at WGN. I worked in the newsroom, where each day was different and exciting in its own way. In the newsroom the deadlines for story coverage seemed to creep in earlier by the day — and even though the stakes were high, I really enjoyed the work. When I made the transition to creative recruiting, I found that this new environment was very similar to a newsroom. 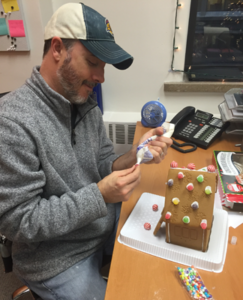 Just as stories would break at WGN, new positions are constantly coming across our desks. In this environment you have to work with urgency — there’s so much creative talent in Chicago that the window to fill these roles can slam shut quickly. It makes for a high-energy and team-oriented environment. While at WGN I met Grumpy Cat®, the sourpuss kitty/Internet sensation (whose real name is actually Tardar Sauce). I thought that was the coolest thing in the world! But as a creative recruiter, I’ve already had the opportunity to work with some super-talented individuals. I’ve connected with designers who are behind national ad campaigns and journalists who have had one-on-one interviews with mega celebs… now that’s cool. As a creative recruiter, not only do I get to meet really awesome people every day, I get to help them enhance their careers. Or, better yet, get them started on a new one. Sort of like me! In the end, I’m happy that I had the courage to make a career transition. I love being able to learn about my candidates and the creative talents they possess. Having the chance to find them their next opportunity — it’s a pretty rewarding job to have! The Affordable Care Act (ACA) is here to stay. The ACA (formally named Obama Care), which was signed into law back in 2010, has finally taken shape and all employers will comply in 2016. The law requires that each individual within a household be required to do one of the following: have minimum essential coverage, have an exemption from the individual mandate, or be prepared to pay the penalty for not complying with the individual mandate upon filing a federal income tax return. One of the big misconceptions of the ACA is that healthcare will be free or low in cost. While free isn’t the plan’s intended purpose, there have been some changes that do help individuals financially. One of the main components of the ACA Plan is that preventive services are at no cost (100% covered), with no deductible if you use an in-network doctor. Services such as routine physicals, certain screenings, child well-visits, women’s health and plan-approved contraceptives are now covered at 100%. Make sure when calling to set up your well-visit, you identify it as a preventive well-visit, so that your visit is billed appropriately. If your condition isn’t life threatening be a smart shopper. Always ask if there is a generic alternative for what your doctor is prescribing. Utilize your health provider’s on-line tools to help search your area for best costs. This could help create additional savings, especially if you have chosen a high-deductible plan. I was recently told a story from someone who needed an MRI. He looked at his health-care provider’s on-line tool to see area costs. The nearby hospital costs would have been $3000 and the free-standing clinic a few more miles down the road (which he went to) charged him $400. The difference in payments can be that significant. Always use an in-network provider – this can help reduce your health care spending. Try calling your doctor to “pre-qualify” your symptoms, an over-the-counter drug could be available for your condition. Review Explanation of Benefits and bills sent by your providers. Make sure that you and the plan are being charged only for services that you received. If you are eligible for healthcare through smartdept. inc. and have any questions about your coverage, contact me, Angi Budnick, HR Generalist here at the smartdept. inc. 872.222.5605 or by email: angi@thesmartdept.com. Happy Holidays, It’s Nice to Meet You (and Other Fun Traditions)! The holidays have returned once again. And, just as in years past, I made the most of my opportunity to fill our environment with holiday cheer. The tree is back, the lights are up and the stockings are once again hung by the front door with care. But this year’s celebration had a new twist. For one thing, we doubled up on the parties! “Wow, party animals,” you’re saying to yourself. Well, maybe. But actually, smartdept. Vice President Matt Crook (sdVP for short) and I made a visit with a purpose — to Tulio’s restaurant in downtown Seattle to celebrate the season with our wayward team. As some of you are finding out, the Seattle smarties have two new teammates. Yira Martinez and Hannah Schwartz (or Yannah, if you want to go the celebrity couples route) joined our team just after Thanksgiving. These ladies are professional, passionate about creative, and eager to find new opportunities for people in the Pacific Northwest. We’re very excited to have them aboard. Exactly one week later, we enjoyed Christmas party #2. This time, it was Penrose Brewing Company in Geneva, Illinois. The fine folks at Penrose opened their doors to our Chicago team and treated us to a brewery tour and access to a private room, which was lined (wall to wall) with barrels of beer. Yeah, it was pretty cool. Once more, I’ll take “Getting to know you” for $1000, Alex! The new additions in Chicago in 2015 include our HR Generalist, Angi Budnick, and Jaime Sklar and Nina Strolia, who joined our recruiting team. In addition, we extended an invitation to our trusted in-house creative catch-all, Jamie Brizzolara. Even though we were familiar (by now) with their work, it was great to get to know them (and a couple of their spouses) in such a quaint and laid back setting. Finally, we added another first to the holiday docket this year. 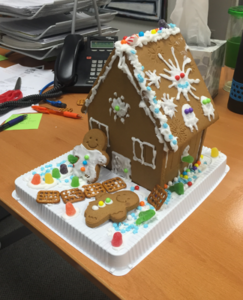 At the request of Chicago’s own Jaime Sklar, we held a gingerbread house building competition. I’m calling it, “The smartdept. 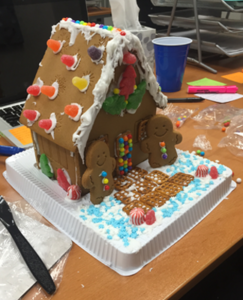 inc. First Annual Gingerbread House Building Competition.” Yep, came up with that one on my own. Who won? Maybe you should decide. I’ve always been a firm believer that cupcakes change lives. This sentiment became a reality as smartdept. inc. partnered with Food Lifeline for Food Frenzy, Food Lifeline’s summer fundraiser. Last year for the fundraiser, our Seattle office hosted an open house and the raffle prize was a fabulous painting by our very talented principal, Michelle Pairitz. This year, we decided to take a different route, and host a bake sale. 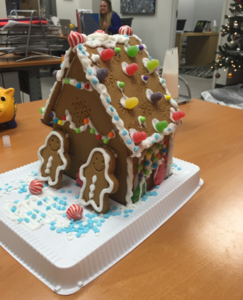 We invited our neighboring offices in our building, our clients, candidates, friends and families to drop by for a treat. Over the course of our two-day sale, we had a few “repeat customers” coming back for another slice of Meghann’s pistachio cake. Overall, we raised $1,062.00! Every dollar we raised equals five meals for Food Lifeline’s programs – that’s 5,310 meals for hungry kids! For the second year in a row, smartdept. 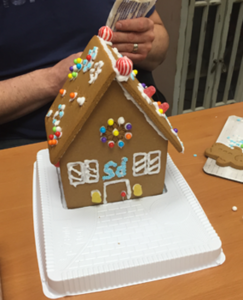 inc. secured first place in the “Per Capita – Kitchen Sink Category” (Professional Services, Technology, Marketing). Overall, Food Frenzy raised $620,000 this year, and it continues to be an honor to be a part of something that’s making a tangible difference in our community. Thanks to everyone who donated via our Crowdrise page and stopped by our office to visit and pick up some treats during our bake sale! “Meghann Francis Kern” is what we affectionately call her (to her face). But you might know her as the Branch Manager of the smartdept. inc. Seattle office! Now, we can include “5-Year Jersey Club member” in the list of ways you can search for her on LinkedIn. 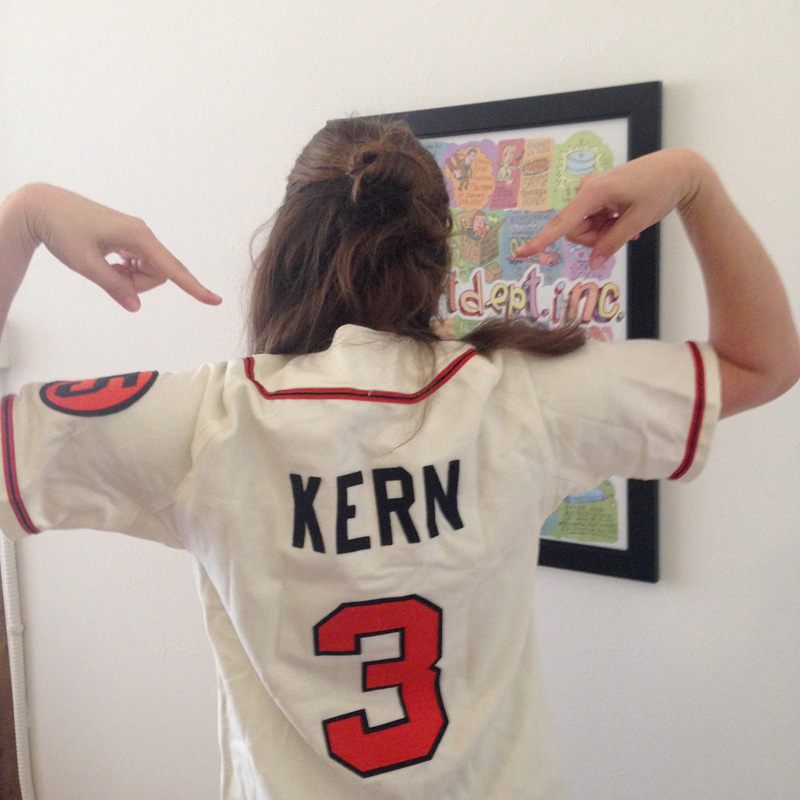 On June 22, 2015, Meghann Francis became the second smarty in two months to garner the coveted 5-year jersey. Although it doesn’t come with a jelly-of-the-month club membership, it’s still something to be proud of. I knew almost immediately, during our very first conversation, that Meghann would be a great fit for our environment. 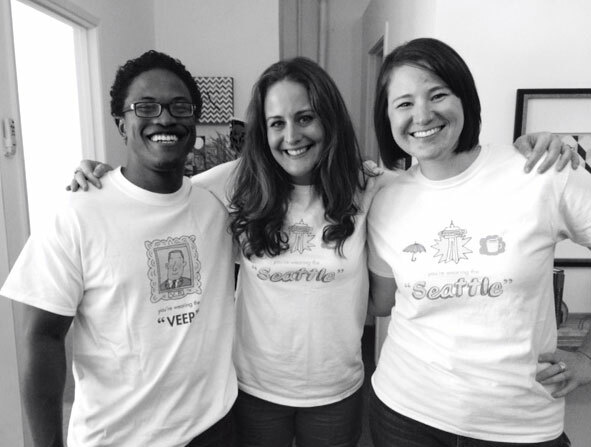 She was hired without staffing experience to be the Creative Consultant for our Seattle office. Meghann is a fast learner, and a short time later was promoted to a senior position. Over the years, Meghann has continued to display not only good business sense, but also outstanding leadership ability. These qualities earned her the opportunity to manage the Seattle branch — and her willingness to take on new challenges opened up the opportunity to change her focus from recruiting to business development, where I’m certain she’ll once again succeed with great enthusiasm. Meghann, congratulations on this great accomplishment, and thank you for everything you do for us here at smartdept. inc.! Our ongoing partnership with Food Lifeline has been very rewarding to our team. We continue to be inspired by the staff and volunteers at Food Lifeline that work day in and out to find new ways to feed hungry families. And this year, thanks to the wonderful staff at Food Lifeline, we got a look into the newly expanded Kid’s Café Program. This summer program brings meals to children who normally rely on the free or reduced lunch programs in Western Washington schools. With the help of many volunteers and staff, along with and fundraising efforts like Food Frenzy, kids from 1 to 18 are able to fuel their summer fun at 18 sites across Western Washington! The growth of the program is allowing more and more children to be served healthy meals every day. This June, the program served 12,298 meals and snacks over the first two weeks of operation. That is almost as many meals in two weeks as they served all of last summer – nearly 1,230 meals every single day! That’s exciting stuff, folks! If you want to learn more about the Kid’s Café program, here’s a wonderful cartoon that illustrates how the program works. Meantime, you can help out this great program! This year, as part of the Food Frenzy fundraising competition, our Seattle smarties decided to mix things up (quite literally) and have a bake sale (July 13 and 14) as part of the fundraiser. If you happen to be in the Seattle area, specifically Pioneer Square, you can stop by, say hello and get a sweet treat courtesy of our in-house bakers and The Seattle Cookie Lady. And, if you’re not in Seattle, you can still support Food Lifeline. Check out our crowdrise page to donate for a virtual treat. 1,290 lbs has little meaning when placed all on its own, but when talked about in regards to keeping children from being hungry after school, and its correlation to providing 1,075 meals for the hungry in Western Washington, it really does bring a heavier significance than just weight. 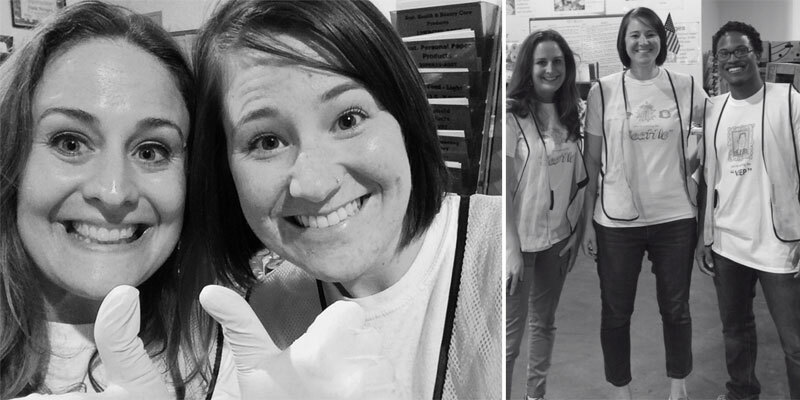 Last Wednesday, June 24, I had the pleasure of volunteering with my new Seattle team at Food LifeLine’s food distribution warehouse in Shoreline. Being able to be part of an amazing organization that is providing such a great service to the community was priceless, and I’m looking forward to helping fundraise for this awesome group July 10-24. If you’re in the Seattle Pioneer Square area, remember to stop by July 13 and 14 for our smartdept.inc. Seattle bake sale! 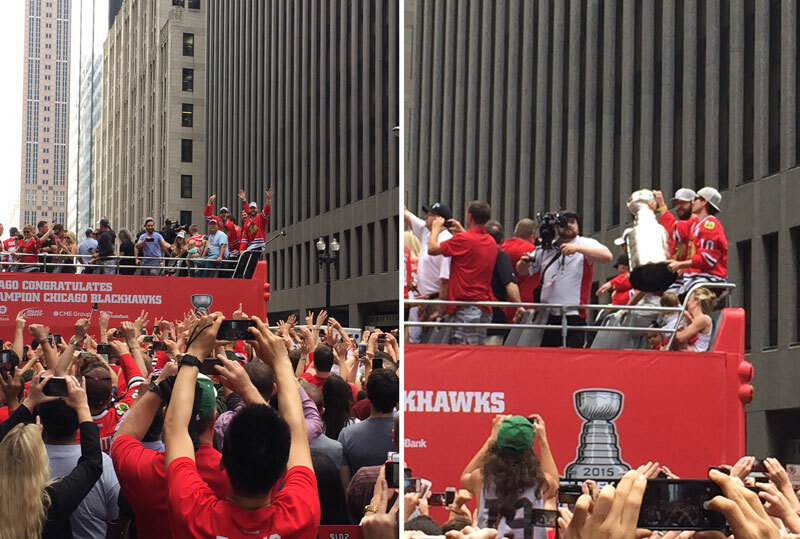 Last Thursday, the Chicago smarties invited our families to stop by the office in prep to hit the street and celebrate the Blackhawks’ Stanley Cup win. Back in 2013 and 2010, we were able to watch from our office windows – as many of you know we’re located on Washington St. – but this time we gathered in the office before heading over to Monroe. We were hard pressed to find anyone downtown that wasn’t celebrating, and it was thrilling to be in the heart of it all. Even if you aren’t a hockey fan, it would’ve been pretty difficult not to hop on the bandwagon. Chicago is a city full of dedicated and determined people that also know how to enjoy themselves, and we feel lucky to be here, working with – and for – such passionate and interesting individuals. It’s times like this that we remember toughing out the arctic blasts of the winter are for a reason, because Chicago is such a spectacular city to call home. Congrats Blackhawks, on your huge successes in the past several years, and thank you for sharing your excitement with Chicagoans all around!